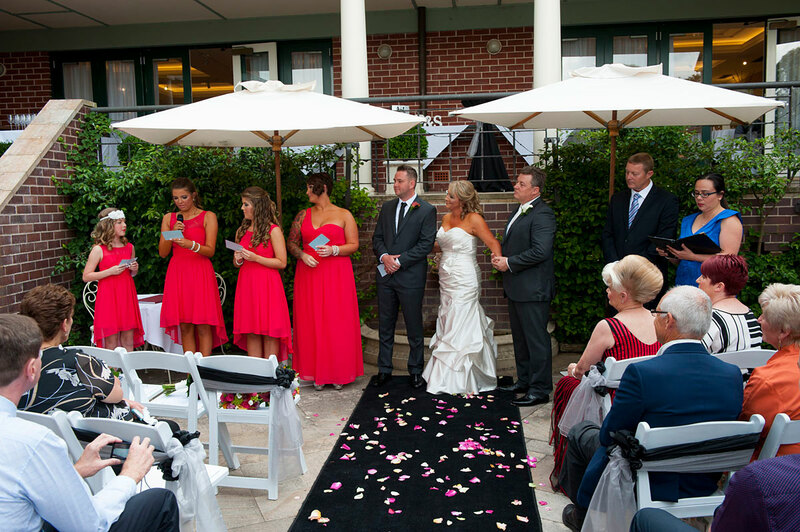 In a civil ceremony in Australia, there are only 5 elements that are essential that must be included within the ceremony to make it legally binding. Monitum (Essential) -The legal part of the Ceremony which must be said by the Celebrant. Full legal names of the couple used during the ceremony. 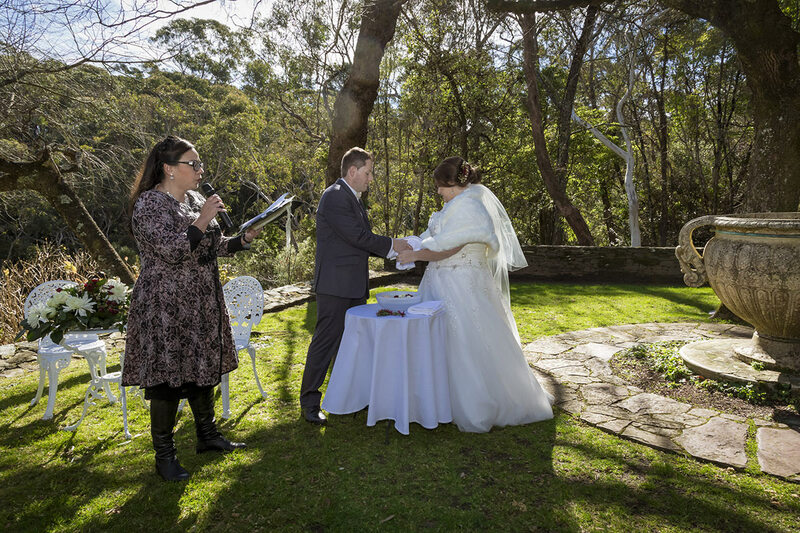 Vows (Essential) -The marriage commitment, can be repeated after celebrant so there is no need to memorise. Declaration (Essential) – Declaration of marriage. Signing of the Marriage Register & Certificates (Essential) – requires two witnesses over the age of 18. If weddings only consisted of these 5 elements, one can imagine how boring and meaningless the ceremony would be. The wedding ceremony is the heart of the wedding day celebrations. For what will be remembered, long after the champagne bottles are taken away, the flowers have wilted, the “Dress” hung up in the closet, is the essence of the ceremony — the words that were spoken, the atmosphere created through them, and the love and joy generated through all of the special moments. There are so many beautiful rituals that can be incorporated into one’s ceremony. Music and poems add another flavour to the whole ceremony. I will help you create a ceremony that is as special as the two of you, one tailored to express not only the quality of your love, but also your touchingly special attributes as individuals and the intentions you share as a couple. 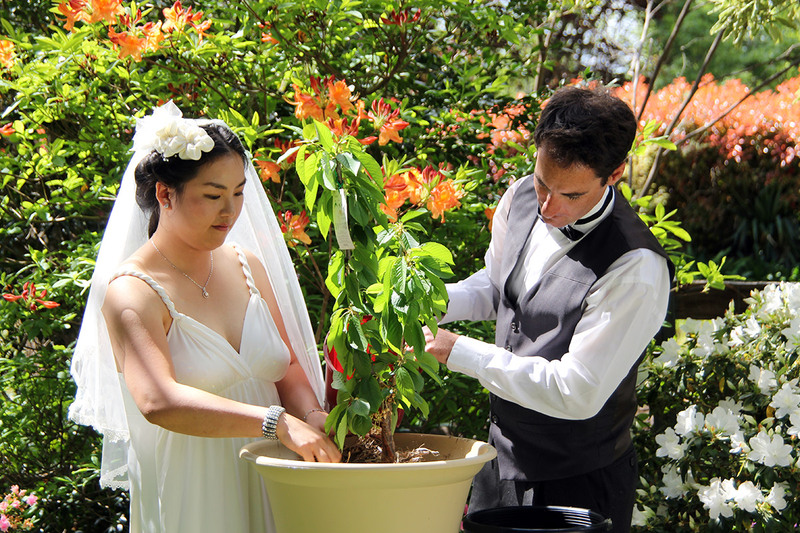 A tree planting ceremony is a great way to symbolize the joining together of two individuals. Trees take many years of growth to reach their version of “adulthood,” and they are a symbol of longevity, tranquillity, and life itself. Mike and Mari chose a Cherry Tree for their ceremony. The blooming of a cherry tree is considered a sign of good fortune and is also a symbol of new romance, love and affection. After the ceremony, they will plant the tree at their home to symbolize the putting down of roots. The lighting of the unity candle can be a very meaningful expression in a wedding ceremony, symbolizing the union of two hearts and lives. Some couples choose to light the unity candle while a song is being sung with no verbal explanation given. Another option is for the celebrant to give a narrative of the candle lighting. If this is your second marriage and you have children, this is an excellent ceremony to involve the whole family. If this is your second marriage, a good option if you want to include your children in the wedding is to have them read a poem. There are plenty of poems which can be found on the internet, one of my favourites is “Blended Family” by Scott Edward Anderson. The hand fasting ceremony dates back to the time of the ancient Celts. It was used to acknowledge the beginning of a trial period of a year and a day during which time a couple was literally bound together – hand fasted. It was however a temporary agreement which could be made permanent after the trial period if both parties agreed. 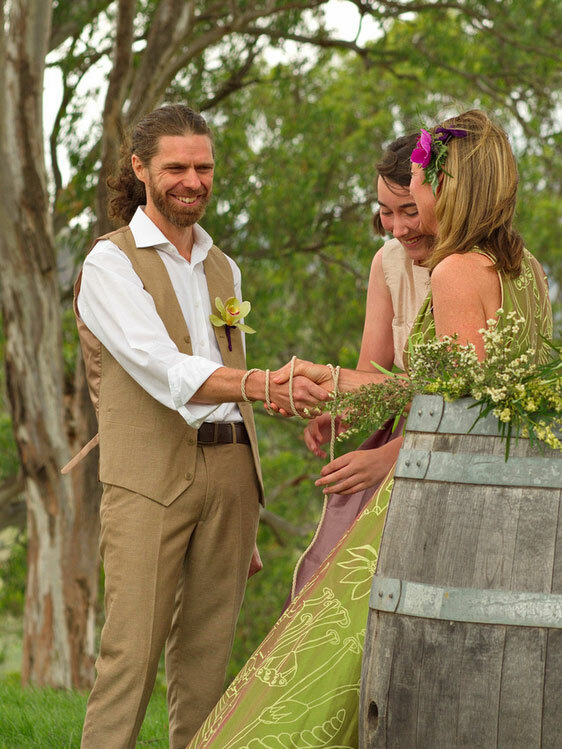 Today, as marriage according to the law in Australia is a lifetime commitment, the hand fasting ceremony is only used symbolically. The bride and groom’s hands are joined together, usually holding hands so the wrists and pulses are touching, with a ribbon or symbolic material looped over the bride and groom’s wrists and tied by the celebrant or a friend. The bride and groom usually remain joined by the looped ribbon until after the marriage vows are exchanged. The final tie being done loosely so the ribbon/s can be removed easily while still remaining tied. This ceremony is about starting this new chapter of your marriage with a clean slate and being vulnerable together to increase your closeness. The Couple washes each other’s hands and dries them symbolizing purification and starting their lives anew. The bowl of water can have lemons or flowers added. This particular day was close to 4 degrees Celsius and the water was FREEZING, so just keep that in mind if you are doing this ceremony in the winter. It’s always fun to have a ritual which involves alcohol. The blending of the wines usually involves the blending of a red and white, which to me sounds like an interesting Rose!!! However a red and white which might be more palatable and mix well, is a Chardonnay (White) and a Pinot Noir (Red). 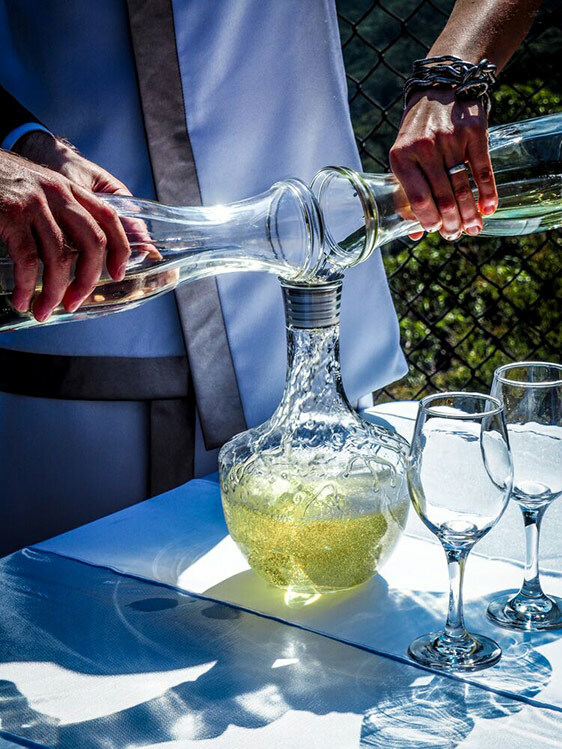 Steven and Angela mixed 2 bottles of the same white wine, as then the wine was shared with their wedding guests. It is totally up to the couple. I think whatever favorite bottle of wine you want to blend would be fine. 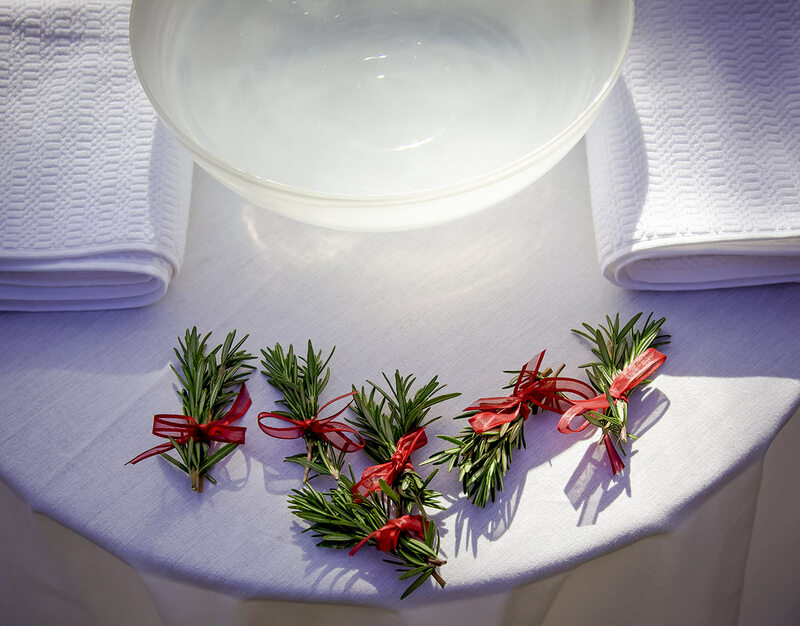 This lovely ritual can be incorporated at any wedding, but made even more significant if you are getting married at a winery. The premise of the ceremony is for the bride and groom to write a love letter to each other the night before they get married and sealing the letter into an envelope, making sure not to read what they have written to each other. On the day of the wedding ceremony, there will be a box with one bottle of wine and two wine glasses set up on a table or even a wine barrel. The celebrant will introduce everyone to the ritual and explain that the bride and groom have written love letters to each other and will place the sealed letters in the box and either lock the box if there is a key or nail the box shut. The idea is to open up to the box on their five year anniversary, read the love letter and share a bottle of wine. However, if for some reason, the couple’s relationship hits a rough patch before their anniversary, open the box immediately, read the letters and this will remind the couple of the reasons why they are together. 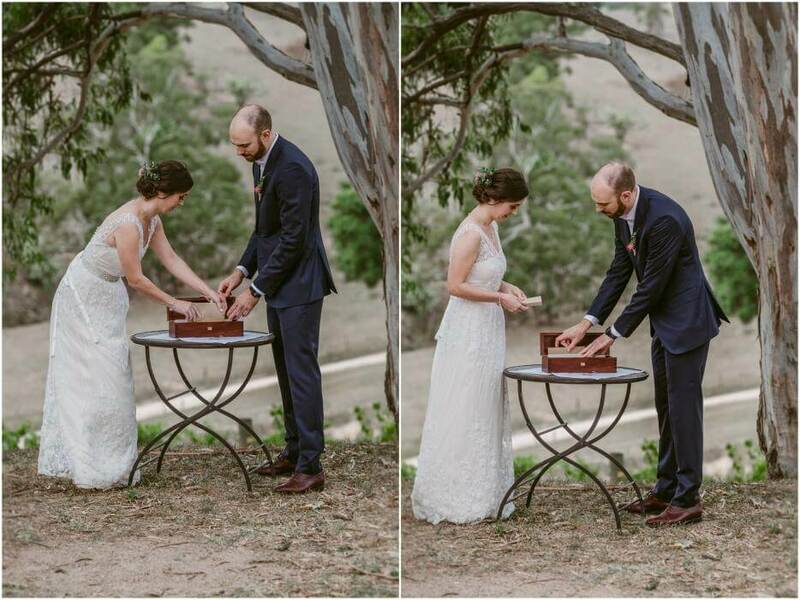 Emily and Adam choose this ritual for their wedding which incidentally was at Dryridge Estate in the Megalong Valley. Emily works within the wine industry, so this was the perfect ritual for their day. Her warmth, sensitivity, flexibility & professionalism make her a perfect choice for anyone. Robyn Yates RN CEO Blue Mountains Cancer Help Inc.
Blue Mountains Celebrant. Life Celebrations with Evelyn. Site by Blue Mountains Websites.